Nadi Tarangini | The pulse of progress. Nadi Tarangini uses hardware and artificial intelligence based , intuitive software that makes traditional nadi Parikshan easy for the user. Using three pressure sensors to record the pulse on wrist at vata, pitta and kapha locations, it mimics the way a Vaidya takes nadi manually. Based on 13+ years of research (including during PhD at IIT Bombay) and validated with data patterns from over 25,000 patients, Nadi Tarangini generates a comprehensive and accurate 10 page Nadi report. It provides evidence-based treatment that results in increased patient confidence from the very first consultation. 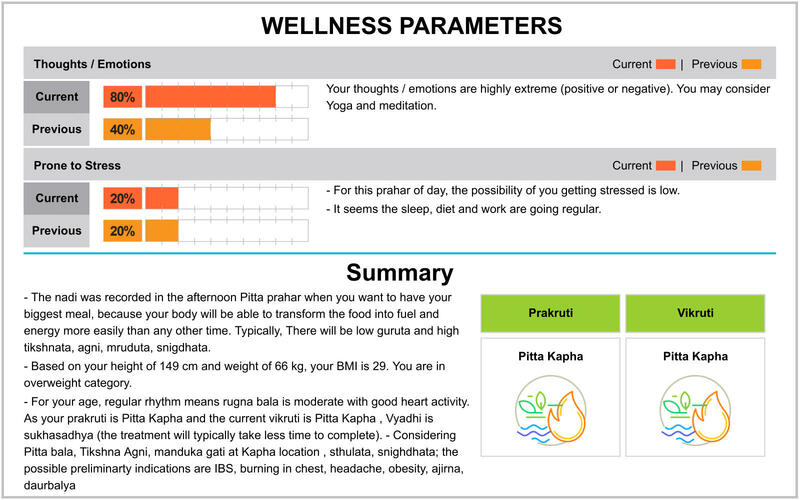 The pulse report provides many basic and advanced Ayurvedic parameters, which have their implications on the subject’s health. 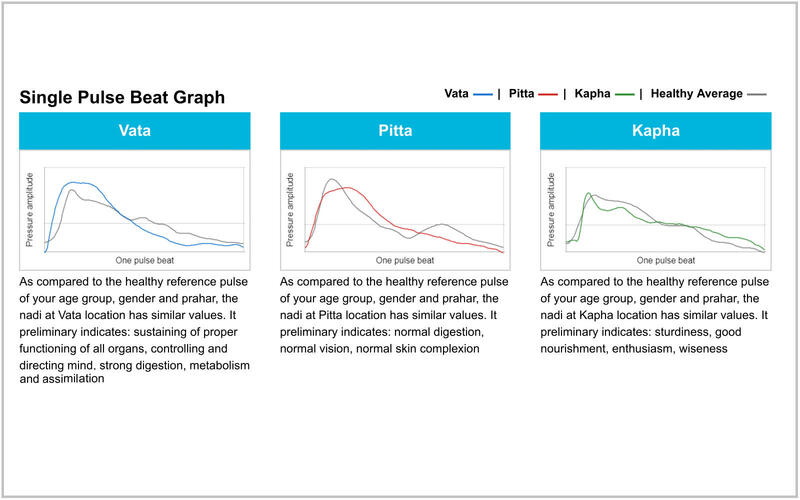 Using the Pulse report, the doctors can show the graphs and healthy ranges to the patients indicating low or high values of the dosha and Nadi parameters. From the patient point of view, the report comparison feature (current and previous values) provides evidence of the treatment’s effectiveness. This helps patients understand the treatment process, thereby improving patient confidence. 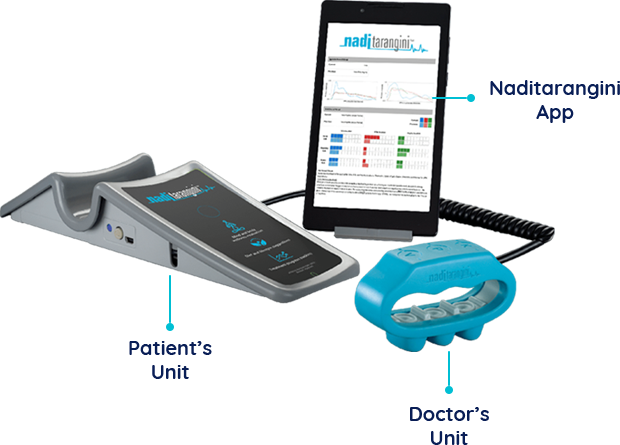 Nadi graphs and their comparison with healthy reference pulse signals (on page 1). Bala and Guna parameters ; comparisons between current and previous visit (on page 3). 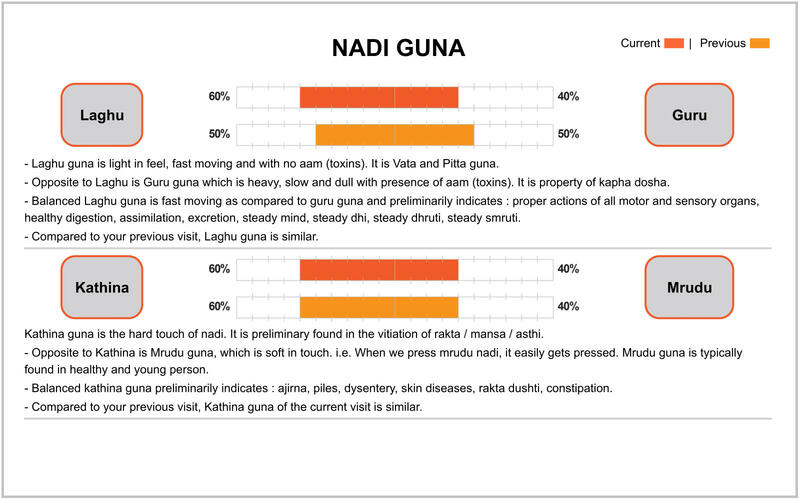 Nadi Guna parameters; comparison between current and previous visit (on page 4). 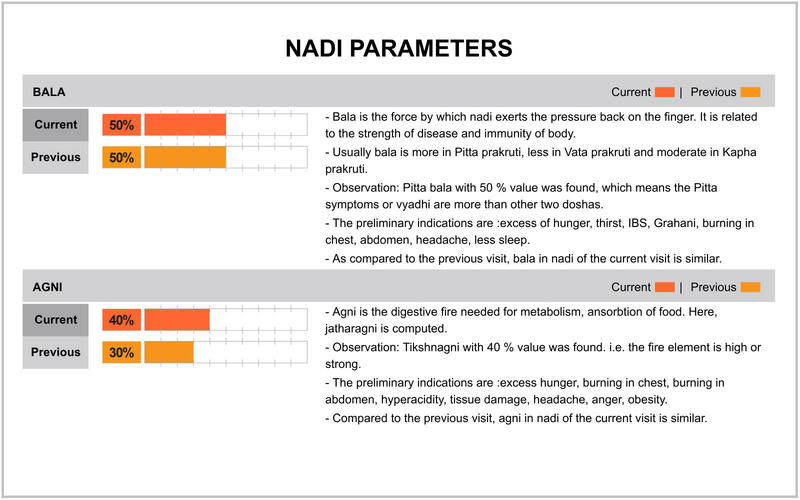 Summary with the preliminary symptoms the Nadi indicates (on page 5). In today’s demanding time, setting up an Ayurvedic practice is difficult – it needs constant innovation to stay ahead. Nadi Tarangini is one such innovation that uses technology to assess Nadi. It helps to make an Ayurvedic clinic a future-forward clinic where ancient Ayurveda meets the modern technology. Such innovations and technologies will make Ayurveda a global science. And most importantly, patients will take Ayurveda very seriously as a science and not as a mystery.